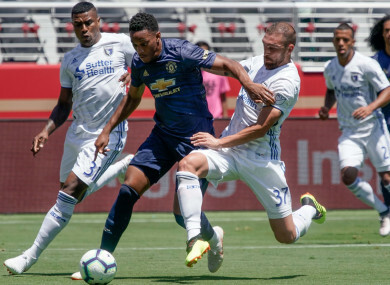 Martial in action against the San Jose Earthquakes last month. JOSE MOURINHO DOES not know if Anthony Martial will return to Manchester United as doubts grow over the disgruntled forward’s future at Old Trafford. Martial left the club’s pre-season tour of the United States to attend the birth of his second child in Paris, but the France international did not re-join his team-mates in the USA. The 22-year-old, who has been strongly linked with a move away after his agent claimed Martial wanted to leave for more opportunities, was absent from United’s 2-1 International Champions Cup win over Real Madrid on Tuesday. As United prepare to return to Europe ahead of their Premier League opener against Leicester City on 10 August, manager Mourinho refused to give any assurances that Martial will return. And the club are reportedly set to fine the player £180,000 (€200k) as he has now missed eight days training. Email “Man United unsure if Martial will return as club prepare to fine him €200k”. Feedback on “Man United unsure if Martial will return as club prepare to fine him €200k”.